May 14th. The Cliffs of Moher | and Hostels are not Hostile | Peter M. Schloss | J.D. - Mediator. Today we bussed to a starting point for a 10 mile hike along the Cliffs of Moher. Our hike descended to sea level and rose along the Atlantic shoreline to an elevation of over 600 feet above the crashing waves below. The trail winds along a cliff face, at times a few feet from the sheer vertical drop. I will include more pictures at the end of this post. First of all I want to take the opportunity to give insight into the lodgings that we tend to select. In the days of Frommer’s iconic travel bible, “Europe on $5 a Day”, hostels were key to budget travel overseas. They were called “youth hostels” because it was presumed that only young people would frequent them. Many imposed an upper age limit, often age 27, on guests. Fast forward to the present and many aging “baby boomers” still favor this simple type of accommodation. Christine and I count ourselves among that number. When traveling abroad we shun such nameplates as Sheraton, Hilton, and even Holiday Inn. We favor the modest one star hotels, casa rurals, and hostels that seem to be frequented by the more adventurous and frugal travelers. Folks seem to be more outgoing and easier to connect with in these establishments. Typically, these lodgings are centrally located, clean, but austere. No phone, no TV in the room, no chocolates on the pillow, no room service… What they are long on is a friendly staff and a sense of community. Hostel residents often cook their own meals, are expected to do their own dishes, share common rooms, and sometimes common bathrooms. The age range of residents varies widely, from late teens to seniors, as in citizens like us. Our lodgings in Spain, Portugal, and these last two nights in Ennis Ireland have been hostels. The Rowan Tree Hostel here in Ennis presents an excellent example of our experience with these budget accommodations. The furnishings and decor are a bit dated and worn. Reception is at the heart of the facility. and our “private” ensuite double can be quickly converted into a dorm during the high season. Our room has 5 beds, but we are the rooms only occupants. The cost of our room is 64 euros a night, which includes breakfast. Rates for more traditional lodgings in this popular venue are more than double this rate, not including breakfast. Our style of travel is not for everyone, but we enjoy the bit of adventure that the variability inserts into our experience. ← May 13th. A Parting, and Mother’s Day. So incredibly beautiful. I love hostels too! What a great looking hike! Lots of gusto! Thanks for writing, as always, such an uplift! Christine, you need to throw the poles over as well (see last picture above) and quit smiling. It will make it much harder to defend you if the jury sees that photo! Hey, don’t give her any ideas!!! 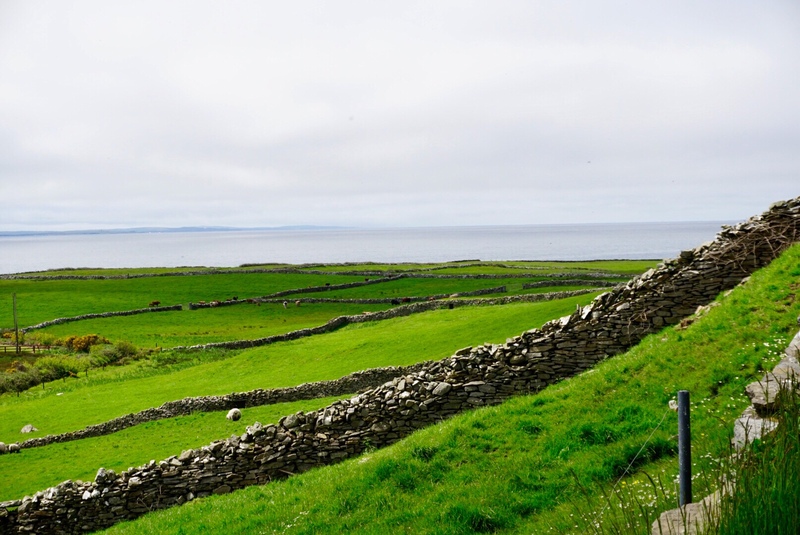 You have given a good concept of Ireland with your photos –also housing to travelers on a budget or better, to get a real feel of the country and people.